Drying out one of the spinnakers in the sun room. The passing of Ron Beament on board Passion X on the Monday of the Port Stephens Regatta was a devastating event. Ron was such a nice guy and an integral part of the group of friends who sail Passion X that everything else pales in significance. The rest of the week was more about comforting ourselves in our grief and honouring his passing. As a group we attended Ron’s memorial service on the Saturday wearing our Passion X shirts and only then did we realise how significant we were in Ron’s life. I am so proud of the team of Passion X crew and supporters who handled the events with great dignity and composure. The support of the Race Committee, especially the Newcastle Cruising Yacht Club support boat, the paramedics and the Water Police was greatly appreciated. The Water Police in particular were most empathetic and professional to the crew and to Ron’s family. The tribute to Ron’s life from the competitors, particularly the Greenwich Flying Squadron team was greatly appreciated and passed on to his family. The rest of the sailing was conducted quietly and with mostly mid fleet performances on time and handicap. 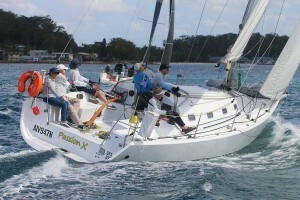 The Newcastle to Port Stephens race was a good event. We started with the big no 1 genoa in very light conditions and did well early by staying in the breeze off shore. We were very well up when the leading yachts tacked back to the shore once the breeze had built. They tacked into a progressive header but got back in front of the fleet which was still in light airs inshore. When we were passed offshore by a Sydney 38 we tacked back and were rewarded with a big lift. Then each opportunity the fleet tacked back inshore for a progressive lift and flatter water. The breeze built to around 17 knots which was too much for the big genoa. The leading Sydney 38 reefed the main and beat the rest of the 38′s by a large margin. Beating to windward is not the strong point of the Didi 40 Cr design which was created for mostly downwind ocean races but we performed very well until the breeze built to over 15 knots. 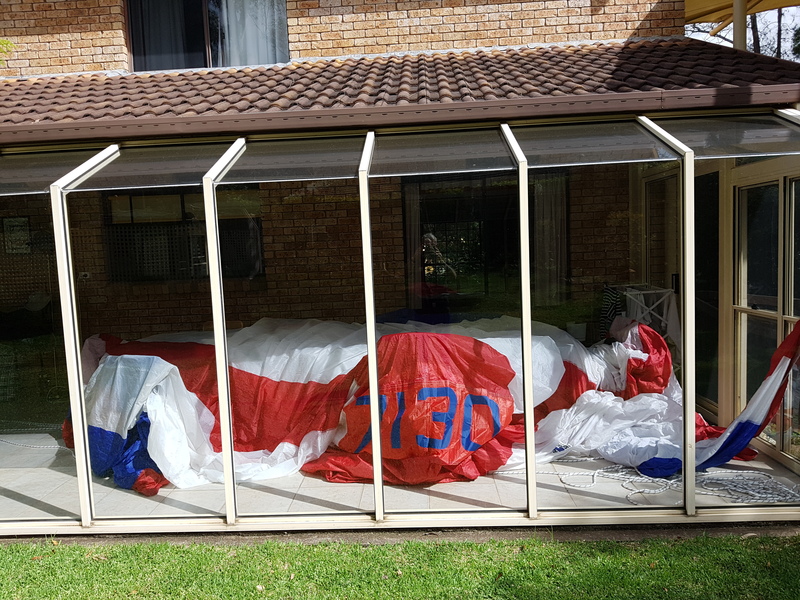 In the Port Stephens races we did well when we could deploy the Code Zero sail but mostly the breeze was free enough for competitors to fly asymmetric spinnakers or reaching symmetric ones. We carry a significant rating penalty for the beating Code Zero and it appears that the rating is meant to discourage the use, not give a fair handicap for this type of sail. The boats with slick spinnaker work did well in these conditions and while our spinnaker work improved through the regatta we did not sail enough races. Reflecting on the good points from the trip up and back the new spray dodger was a great asset and made the long trips much more enjoyable that otherwise. We motored back into a 16 knot southerly on the Monday after the regatta sitting under the protection of the spray dodger. Elaine remarked on how much more comfortable the tiller steering and spray dodger was on Passion X compared to the wheel steering on Passion where the helms person was exposed to the spray. The combination of spray dodger, tiller and auto pilot made the trip much more comfortable. We spent the nights during the regatta in the large quarter berth which left the V berth free for sails. I am now contemplating removing all the V berth cushions so that it is dedicated to sails and we are less concerned at all the water that comes in with wet sails. The timing of rains squalls at this regatta was particularly inconvenient for wet sails and we have a job ahead to dry five sails. The fridge is too good. Anything placed in the open freezer section did freeze and if in glass then the glass broke. So frozen were the contents that no liquid escaped into the bottom of the compartment. Also the idea of having a separate cold storage bag inside the fridge for the food worked especially well at keeping the freezer clean and uncluttered. The Yanmar 30Hp engine performed well. We averaged 6 knots for the trip from Port Stephens to Pittwater against wind and tide. Cruising revs was around 2800 RPM for the return trip against 2400 RPM for the trip up when we had wind behind. I had been concerned at the amount of white smoke coming from the exhaust but after a refill at Nelson Bay and with some mixing of the tank contents with the wave motion the smoke stopped so I am putting that down to a diesel fuel issue. We used about half a tank for the trip home despite the headwinds and current. That was 18 hours of motoring so I estimate with the 20 litres back up in the fuel locker we could motor for over 40 hours. Nothing broke! No fittings, no ropes, no sails etc so it was on inexpensive regatta from that perspective. Everything worked as it should so there is no follow up needed other than drying sails. Our last stage of the motor home was from the comfort of a very peaceful Refuge Bay to our mooring in Greenwich. With the help of an outgoing tide in Pittwater we made the trip in record time and spend a couple of hours unloading Passion X alongside the pontoon at GFS. All the Category 4 heavy items were unloaded, some for washing and storage and some just to put the boat back into light ship mode. The salt spray was washed from the deck and the deck stored sail bags and the tanks emptied again and refilled up to a quarter full. It took forever to empty from the empty level on the level indicator to really empty so there is a good safety margin from the water empty level to really dry. The two day trip home was a good opportunity for Elaine and I to reflect on the events of the past week and how grateful we are for the support of a wonderful crew.